When we picked up the next session, Kenan-Tal’s player wasn’t available, so we decided he and Bruna went back to the camp to check on the prisoners and make sure the mercenaries they hired were ok. Meanwhile, the group decided to unspike the western door and go explore the prison cells. At the end of the hallway, they found a door they hadn’t explored, but as they approached it, they heard the sound of a roaring monster. They became defensive, waiting for the monster to rush out of the room and attack them. When nothing but sound came from the door they waited, trying to see if the sound was on a ‘loop’, but it kept going. Finally, Rage Claw and the rest burst into the room only to find it empty. A brief check revealed no invisible foes or other immediate threats. So they turned around and left. After ten feet or so, the sound stopped. Though Anika couldn’t figure it out, they basically assumed ‘a Wizard did it’ and shrugged. The party was at a loss of where to go so they back tracked to the room where the ghoul had fled and decided to explore the tunnel it went down. They were attacked by some stirges on the way, but the lizardmen and nar made quick work of the creatures. At the end of the corridor, they found a set of open doors and a large chamber. They could hear the sound still and the ghoul’s prostrate body lay sprawled on the ground. It was an octagonal shaped room, with an old Valasian statue of a triumphant man pouring (running) water from an urn into a grate on the floor. A plinth stood in front of the statue with Old Valasian script. Anika could translate, but the poem made little sense, something about Imperials resting, being anointed by water, and rising to reclaim their goods. There was a bridge leading out of the room into a vast tunnel. The bridge arched over a small river that flowed from an arch in one wall to the other. Rage Claw walked into the water and tried to see how far back the water flowed, but left when he realized something was crawling into his boots. Taking them off quickly, they discovered that leaches had attached themselves in the joints of his armor. A moment or two burning them off and they were ready to walk over the bridge. From the bridge, they took in a sight that brought them up short. A wide tunnel lead beyond the flickering light of their torches. 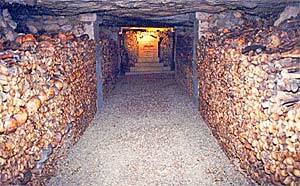 On either side of the tunnel, stacked at least twenty feet high, were piles of orderly arranged human bones. The stacks were so high and thick, they could not see how wide the tunnel actually was, just that the walls of bones left 20 feet between them. Long Tom cast detect magic to scan the room and while nothing was glowing in the room they were in, all the bones he could see were enchanted. Like this…only the walls went higher, and deeper, and it was much, much creepier. The party remembered what the hobgoblin had told them, about a room that looked scary but really wasn’t. They hoped this was what he was talking about. They made a few tentative tests to make sure the walls didn’t come alive, but when nothing happened, they advanced. The bone filled catacomb was long, very long and there were side passages filled with bones that made it even larger. After a couple hundred feet, they reached a room with a plinth, upon which stood a fifteen foot tall statue of a metal skeleton (that did not radiate magic). Down two sets of side passages (one to the east and one to the south) they heard noise and decided to have the party put out their torches so the lizardmen and Grimnor could advance forward with their infravision and try to sneak up on whatever was making the noise. There was some grumbling from the humans, but eventually they agreed and the people who could see in the dark snuck off. A few moments later, they heard the sound of battle being joined and hastily put their torches to light. After a round they ran down the eastern tunnel towards the sounds of echoing screams and yelling. When they turned the corner, they were greeted by a horrific sight. The bone filled hall was now covered in green gore and torn limbs. Dead goblins, brutally ripped open or torn apart, lay scattered about the hallway. Further from them, the lizards and Grimnor were fighting seven or eight goblins that still remained. The lightbearers got in the fight then, but it was mainly a cleanup operation at that point. We called the game there, after they looted the corpses and camp. This did bring up the Cleave concern again. The Nar Gladiator (Thrassian Gladiator from the Player’s Companion) gets three attacks and gets his strength bonus to each of these. So RC has a 16 Str and does 1d3+2, 1d3+2, 1d8+2. He’s also level 2, meaning he can cleave off up to twice, and unlike a normal character, he has three chances to trigger a cleave. The lizardmen were similar, being 2HD monsters, but they (like most monsters) did not get their strength modifier added to their Claw/Claw/Bite routine, so their damage output lead to maybe 1 to 3 goblins dead, while RC could killed up to 5 a round with good rolls. Granted, they are just goblins (who have weak hit points). I also made a slight mistake, allowing RC and the lizardmen to sort of leap frog around within the ranks of the goblins (one would claw his way through the ranks, then the next would run past him and continue, etc, etc). I’m not too sure that if we’d used miniatures how this would have played out, but maybe it wouldn’t have been any different then how it actually played out. 10’ corridors are difficult to maneuver around in for sure. The human characters were a bit miffed that they got to do so little and it certainly led to backlash against the ‘put the torches out’ idea, which sadly is a pretty good one (except for how long it takes to relight a torch). They were also amazed to learn that Infravision was a third level spell. Playing old school style certainly brings up the various expectations that exist from different editions. ‘Little problems’ like seeing in the dark and easy access to light are definitely handled differently in later editions (Pathfinder casters can cast infinite light spells for example). Another question that has come up is how many characters can fight abreast in a 10′ wide corridor. I sort of assumed 2, thinking in terms of 5′ foot squares and all that, but I’ve read some stuff that makes me wonder if it’s not supposed to be 3. Anyone know for sure? Read the next play report! This entry was posted in Ahlyen, Play Report, Role-Playing, Sundered Empires and tagged Advanced Dungeons & Dragons, Adventure Conqueror King, Ahlyen, B/X, bones, catacomb, catacombs, Dalagar, Dungeons & Dragons, Goblin, Lilith, Micah Blackburn, Old School, OSR, Otho, Play Report, Rage Claw, roleplaying, skeleton, Sundered Empires, The Lichway, undead. On how many fit abreast in a 10′ corridor… I don’t know if ACKS has a definitive answer (it well might), but just last night, in the 1E dragonsfoot.org forums, I came across a thread talking about “space required” for weapons. In 1E all weapons had a listed number in feet which determined how much space a person needed to properly wield such a weapon. Also, PCs needed a minimum of 3′ of space to properly fight. So you take the larger of the two.